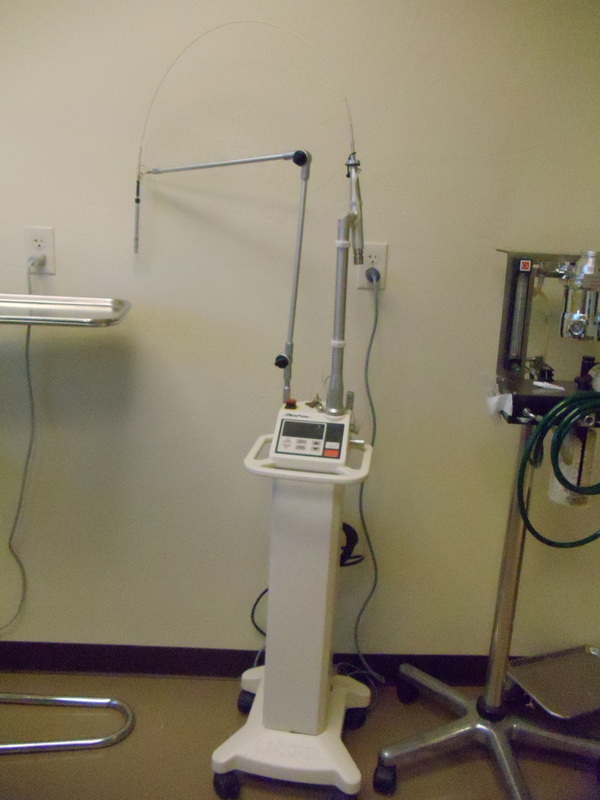 We offer CO2 laser surgery for most of the surgeries we perform. It is a valuable tool that we highly recommend. The way it works is by using a highly focused infrared beam from which the target cells rapidly absorb energy. That energy instantly ablates the soft tissue and, at the same time, seals capillaries, small blood vessels, lymphatics, and nerve endings. There is no mechanical contact between the tissue and the tip of the laser unit. The laser handpiece is held 1-2 mm above the intended surgical site. 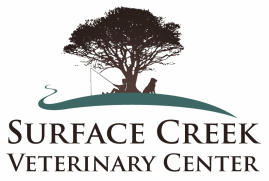 The laser is equally adept at incisions, excisions, and ablations, which makes it a very useful and versatile aid in the treatment of your animal. The laser seals nerve endings and lymphatics as it cuts, resulting in less pain and edema which leads to a more comfortable post-operative recovery. Less bleeding, less swelling, and less pain usually allow the animal a more rapid return to normal activities. CO2 laser surgery is a "no touch" technology, meaning the tip of the laser unit never comes in contact with the tissue it is being used on. This means there is less risk of contamination of the surgical site plus the laser beam kills bacteria in its path, producing a sanitizing effect. The diameter of the laser beam may be adjusted down to a fraction of a millimeter or up to a wide swath. This allows us to use these different settings to do procedures ranging from removing one ectopic eyelash to ablating areas of inflammation in a mouth with severe gingivitis. The power of the beam may be set for removal of only one or two cell layers at a time, or adjusted to remove a relatively large amount of tissue with each pass. The laser beam seals capillaries and small blood vessels as it "cuts" the tissue. This dramatically reduces bleeding, resulting in a much drier and clearer surgical site. This allows the doctors a better view of the area they are working on, and can improve accuracy and decrease surgical time.